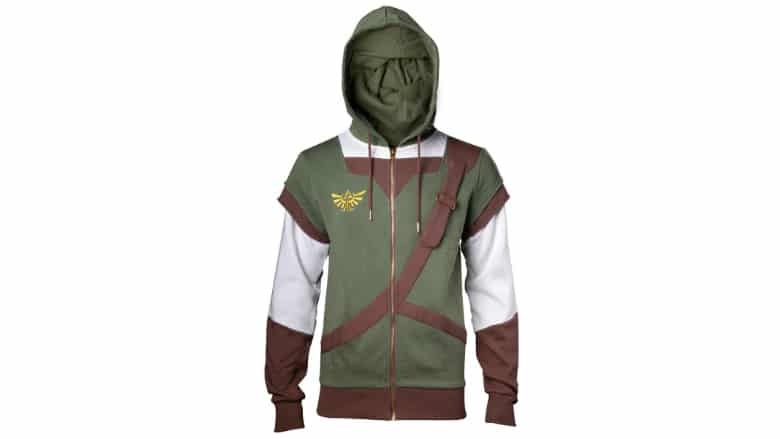 Legend of Zelda Link Cosplay Hoodie Transforms You into the Hylian Hero | Nerd Much? The Legend of Zelda: Breath of the Wild decided to forgo Link’s traditional green tunic for the most part in favor of alternate clothing options for the character. But fans know that the green tunic is the true OG outfit for our Hylian hero. 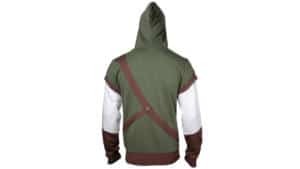 And for those fans Merchoid is now offering preorders on their Legend of Zelda Link Cosplay Hoodie. 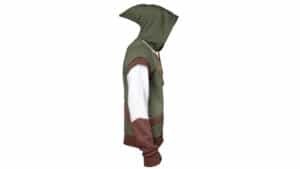 Merchoid says that they plan to ship their Legend of Zelda Link Cosplay Hoodie early next year. So there’s no need to pull the Master Sword from the Pedestal of Time to speed things up. The hoodie is officially licensed by Nintendo and the design is being offered in sizes small through XXL. The design is pretty spot on to Link’s look in the majority of Zelda games. The Legend of Zelda Link Cosplay Hoodie is covered primarily in forest green. 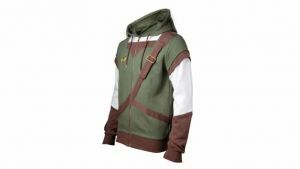 But there are brown accents throughout representing the under layers Link wears in the games. There’s even a mock sword sheath that goes across both your back and chest for further legitimacy. 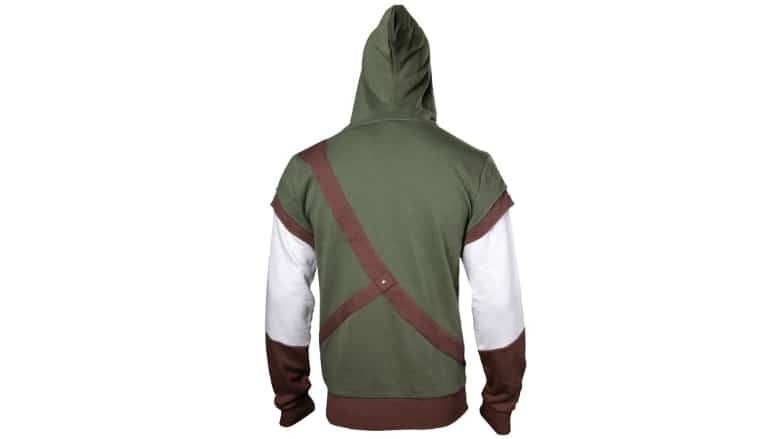 The hood portion of the Legend of Zelda Link Cosplay Hoodie is forest green too, mimicking Link’s classic hat. And anyone that questions the validity of your bloodline will shut up quick when they notice the Hylian Royal Crest on your chest. 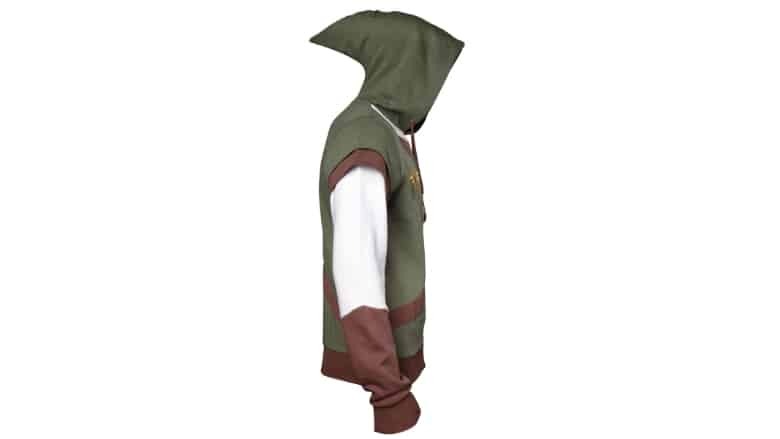 Merchoid’s Legend of Zelda Link Cosplay Hoodie is a steal at $59.99. As always, the outlet offers free shipping on their products. And if you’re unsatisfied for whatever reason, the site offers a 100 day no hassle return policy. 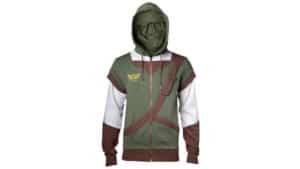 If you’re into casual cosplay, or if you’re just a big Legend of Zelda enthusiast, there’s no better way to show off your fandom than with the Legend of Zelda Link Cosplay Hoodie. We already have a Hero of Time, go out there and be the Hero of Style instead.